Kip Wright organizes the volunteers who tend to the Lake Campus community garden, which produces several thousands of pounds of food and helps connect students to the Mercer County community. From the sizable squash spreading its vines far and wide to the towering tomato plants dwarfing whomever stands near, the Wright State–Lake Campus Community Garden is harvesting one of its most abundant produce yields to date. “The season isn’t even halfway finished, and we’ve already plucked more than 500 pounds of produce,” said Kip Wright, steward of the garden and instructor for the Lake Campus Law Enforcement Academy. 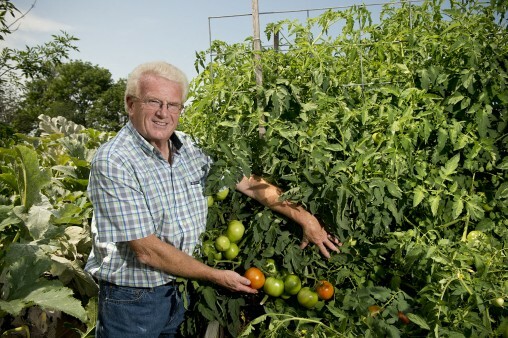 Wright has spearheaded the garden since day one in 2011. The concept of the project sprouted from a growing need to further engage Lake Campus students, faculty and staff in the Mercer County community. Once Wright teamed up with Ron Kremer, a retired accounting instructor at Lake Campus and an experienced farmer, the garden began to take shape. 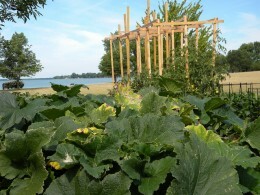 There were soon 12 raised beds, each standing four feet tall. Wright said they were built to last. 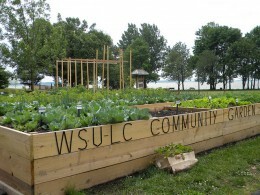 The Lake Campus Community garden includes 12 raised beds, each standing four feet tall. Once the beds were constructed, the dirt came next. Organic materials and waste that were composted and recycled by Lake Campus students, staff and faculty were thrown into the mix, in addition to locally donated manure. Wright expects the garden to exceed last year’s 3,000 pounds of donated produce. The community engagement doesn’t stop at local pantries, though. Once the news of the garden’s success began to sweep through the area, the scope of the project has widened. 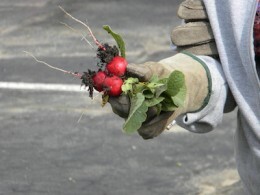 Volunteers grow more than a dozen fruits and vegetables in the community garden. With the demand for the community garden’s produce growing faster than the plants, Wright said the volunteers often have to get creative to overcome challenges such as occasional pests and drought. Volunteers have also devised inventive ways to get everyone involved. This is just one of many ways those involved with the garden strive to innovate, says Greg McGlinch, one of the volunteers and a Lake Campus instructor who teaches Introduction to Agronomy, the business side of farming. The garden is expected produce more than 3,000 pounds of produce, which will be donated to local food pantries. Its future looks bright, with, Wright said, the garden bringing the community together in ways he never thought possible.